At the beginning of the twenty-first century, the classical guitar finds itself at a level of quality and popularity that was unimaginable even fifty years earlier. Happy Memorial Day! Please make today a time of remembrance! I did spend some time in the shop today French polishing the Torres/Santos guitar that I need to deliver to its new owner soon, and I worked on a copy of the 1961 Hernandez y Aguado guitar. 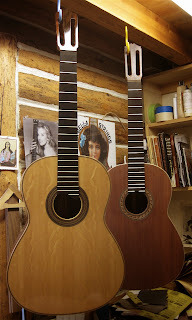 The 1961 Hernandez y Aguado guitar, seen in the foreground in the above photo, needed shellac applied to its sides. A couple of more coats of shellac and I will be able to start French polishing the sides again. I say, again, because I ended up sanding down to the wood to make sure that all the pores really were filled and get rid of some piles of pumice. The finish work you do can never be good enough! This Hy A copy has a redwood top, the top came from a redwood board that was salvaged from a barn on the border of Yosemite National Park, and it has Indian rosewood sides and back, the sides are laminated with Alaska yellow cedar. This is a "speculation" guitar, I really made it for myself, but I will offer it for sale once it is completed. The guitar in the background is close copy of a 1930 Santos Hernandez guitar, click here to see the plans that I followed, that also has a redwood top and Indian rosewood back and sides, both sets purchased from LMI. This guitar I am making for a young man who is in the guitar program at Metro State University, Denver. 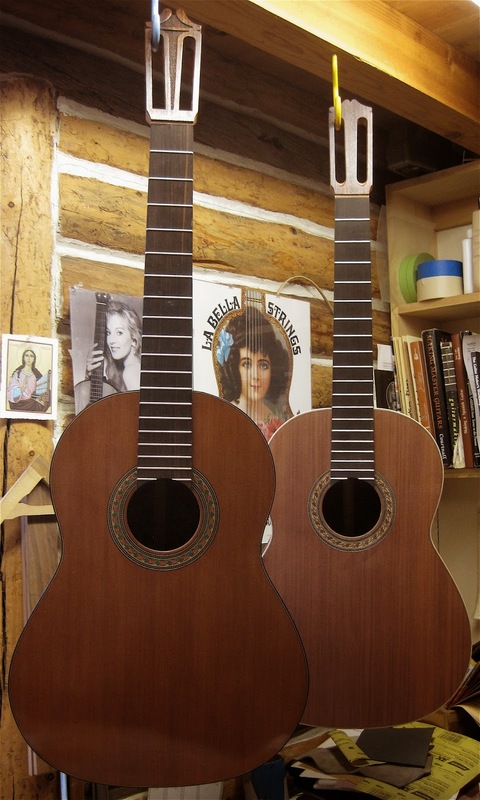 The guitar in the foreground is a close copy of the famous FE19 guitar made by the great guitar maker, Antonio Torres. It has a bearclaw Sitka spruce top with grandillo back and sides, this is the one I have am in need of finishing soon. If you follow my blog, you know who this guitar is being made for! All three of this guitars will be exceptional in sound, loudness and playability.